As many of you will already know (Film Studies For Free hopes), the best English-language Media Studies blog in the whole World Wide Web is Henry Jenkins‘ Confessions of an Aca-Fan. Quod erat demonstrandum. Two of the Aca-Fan‘s most recent posts (‘Why Universities Shouldn’t Create “Something like YouTube” (Part One)‘ and ‘Why Universities Shouldn’t Create “Something like YouTube” (Part Two)‘) are such important contributions to debates about the future role of the internet in university-level education (and beyond) that I feel they should be required reading for anyone at any level in the academy responsible for determining future policies about ‘user-generated content‘ and other related matters. Film Studies For Free will leave that resounding recommendation with you for now. Today’s blog post is concerned more with a slightly different intervention from Jenkins and the MIT Comparative Media Studies lab, on ‘spreadable media’. In the Aca-Fan‘s post on April 24, 2007, ‘Slash Me, Mash Me, Spread Me…‘, Jenkins wrote the following about ‘the sensibilities of a generation of popular artists who have grown up in an era of cult media’ and participatory culture. They know what fan creativity can accomplish and they want to be part of the game rather than sitting on the sidelines. 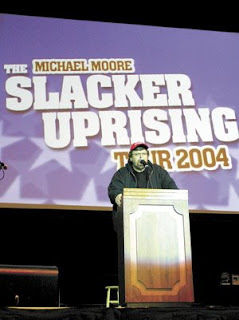 In her most recent posting (October 17, 2008) on the group blog Convergence Culture Consortium — ‘Looking a Gift Economy in the Mouth: Michael Moore’s SLACKER UPRISING’ — Sheila Seles very valuably takes up this matter of ‘spreadable content’ in relation to the kind of online, free, film content with which Film Studies For Free, not idly named, is hugely concerned: specifically, in Seles’ post, the free online distribution by documentarian Michael Moore of his latest film Slacker Uprising (get it HERE only if you reside in the USA or Canada). I haven’t seen this film yet, but Seles asks some very important questions about Moore’s distribution tactic, and she compares the case of Slacker Uprising with that of other films distributed in this and similar ways, such as Robert Greenwald‘s Iraq for Sale, which used to be (putatively) legally available completely for free via Google Video (the much linked-to page suggests it’s now been removed). Film Studies For Free urges you to read Seles’ fascinating post, and asks its readers earnestly for any opinions about her concluding argument in it, in the context of wider debates about spreadable culture: will ‘Slacker Uprising […] provide an interesting example of the impact of quality and branding as we try to articulate tangible distinctions between “free” content and content that will spread’? We might wonder also if, to borrow Seles’ post’s titular metaphor (and ‘mashup’ along the way two old proverbs and a cliché), are these ‘gift horses‘ for courses, or is there no such thing — in indie-film download-land, at least — as a truly free thoroughbred? Answers, please, in an email or on a comments page.